Greek cuisine has influenced culinary trends since ancient times. With foods traditionally made with olives and other fresh vegetables, herbs, fish, and wine, Greek food provides a unique kind of comfort. 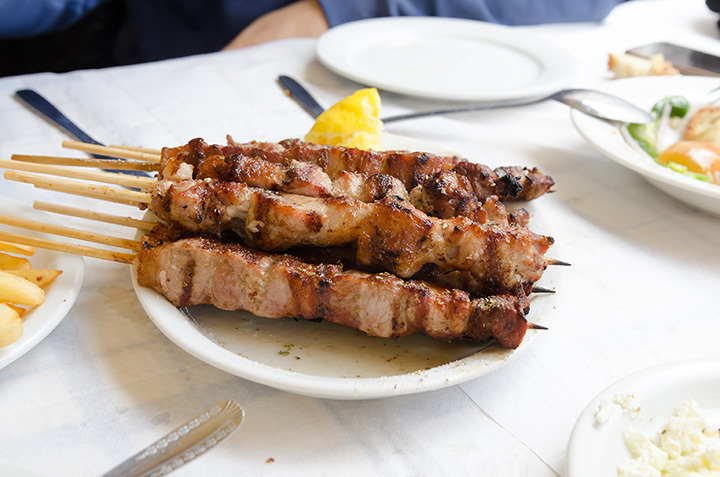 You can thank Greece for moussaka, gyros, spanakopita, tzatziki, and much more. Is your stomach rumbling yet? Here are the best Greek restaurants in Oklahoma. Zorbas calls itself the “region’s premiere Mediterranean restaurant.” On Saturdays, from 8:30 p.m. to 9:30 p.m. enjoy belly dancers with your meal and drinks. The pomegranate salmon is a local favorite, but all of the menu is quite delectable. Located in the Brady Arts District, this bistro has a wonderful menu of “Mezze” or shared appetizers and entrees that should please just about anyone. They have a lot of traditional dishes that you don’t find on many menus, such as Shakshuka, Dhofar Lamb and Keftadakia. This hidden gem in central Oklahoma City is a lunch spot where you can find all types of wonderful food. The Middle Eastern Platter include kibbi, grape leaves, falafel, hummus, tabouli and pita. Make sure to add a piece of baklava from the bakery. This café features recipes that have been handed down for generations. The Hashwa Plate is their signature dish, but they offer a wide variety of entrees, including vegetarian options, for every palate. Shawkat is Oklahoma’s only pita bread bakery, and they serve some delicious Mediterranean food, too. Try their Pie Platter to get a good variety of their offerings. Not only does Let’s Do Greek have a brick-and-mortar restaurant, they also have food trucks that show up around the city. On Mondays, stop by the restaurant for a special on gyros. They’re delicious! Leena’s has many ways to order. You can order a “Mediterranean feast” which feeds four to six guests or get their buffet. They also offer platters and a la carte items. This Greek restaurant offers traditional favorites, such as gyros, spanakopita and stuffed cabbage, along with some Americanized versions, like feta fries, a cheeseburger served in a pita and a Zinger sandwich, chicken nuggets wrapped in a pita bread with lettuce, tomatoes, onions, mayo and pickles. This restaurant serves gyros as its staple items, but it does have a Gyro Quesadilla. It’s Philly Ali is a mashup of a Philly cheese steak and a gyro. You’ll find them at their brick-and-mortar store or in a food truck around town. Any restaurant that can stick around for three decades in a college town has got to be good. The restaurant is known for its incredible gyros. It’s a cash-and-carry restaurant, but it does have an ATM inside.